The book contains MUCH action, adventure, and suspense. It is set in Florida and follows a brother and sister that find themselves in the middle of a mystery that could change scientific history. There is a possibility that THE missing link has been found during an archeological dig that their uncle was heading up. When he becomes sick, they join their father at the dig site where strange things beginning happening all around them. Throughout their time at the dig they have the opportunity to talk with their cousin about Creation and if evolution is a possibility. The Missing Link: Found uses a “current” story line to teach the reader the differences between a Creation view and the evolution theory. There are explanations in the book on carbon 14 dating, fossilization, (and more) along with a handy glossary and reference section at the back of the book for more information. The idea for the series began when Christina (a homeschooled student) was 12 years old. She wanted to write a mystery novel and her mother jumped right in and helped her with her idea. Together they co-authored the three book series. I am obviously not the target audience for this book *grins*, so some of the story line seemed a little unrealistic to me– but it’s fiction and for a reader in the intended audience it would be an exciting read. It was a HUGE encouragement to me hearing that the author Felicia was homeschooled, especially since I have a little one that loves to write – and it makes me want to encourage her even more in her writing! What a great accomplishment! Media Angels currently has a pre-Christmas special to buy the entire series for $22.00. 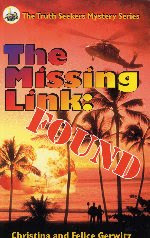 The Missing Link: Found is also available individually for $8.99. There is also a literature study guide available for the book from Media Angels for $6.50. Media Angels is a publishing company that provides study guides on the topic of Creation science and corresponding activity packs, produces mystery novels for tweens and even has online seminars and DVD productions. The owners of Media Angels have homeschooled their children since 1986. If you would like to read other's reviews of the book, you can head over to the TOS Homeschool Crew blog and visit there!